If you get this error while uploading image or any media to WordPress you can only suspect some things and start investigation by changing and checking settings one by one. Good news - WordPress returns exact error message! Error details are in the HTTP response from async_upload.php script formatted as JSON. You can easily find it using build in Developer Tools in Firefox or Developers Console in Chrome. In Chrome or Firefox press F12 and go to Network tab. Try to upload image again or do any other action that will trigger the error. At the bottom left of Developer Tools/Console find async_upload.php file name and click it. Go to Preview tab (see attached images). This will show you the error details. Click screenshot below to enlarge. Check permissions for upload folder. It should have 755 mask. Check upload path. It can change for example when you switch your hosting company. Go to https://your_server/wp-admin/options.php and find upload_path. Check if it is correct. The response suggests that upload was successful. You can see the pictures new URL and date. The error must be on the client side. If you don’t see imags maybe there is a JS error… I suggest that you check Console for any JS errors. 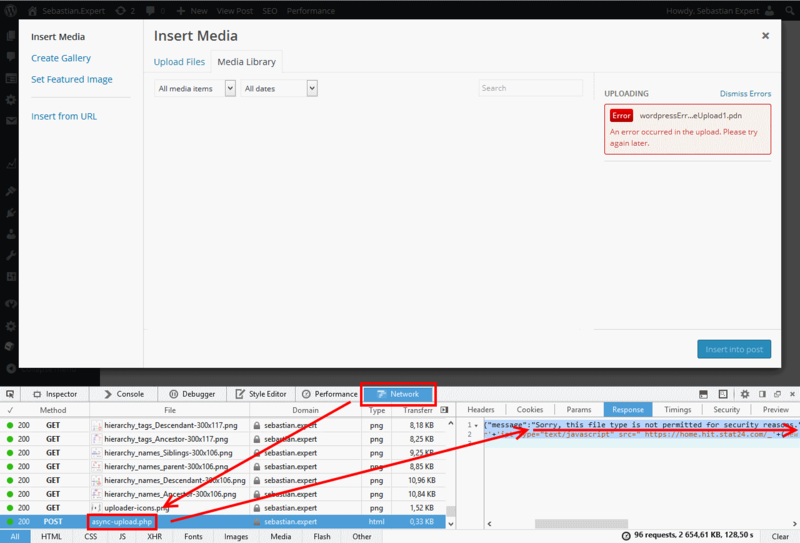 Also switch between List and Grid view in Media Library. Response Preview is blank empty. What does it mean? The same problem occurs when I had added plugin “WP Statistic”. After deleting this plugin all return to working state. 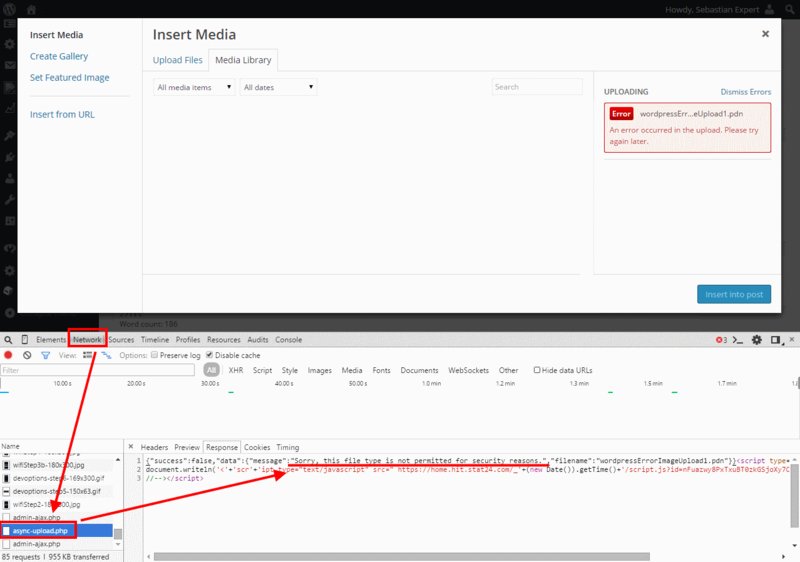 When I try upload the image and receive the error, I check the asycn_upload.php file and it says “Failed to load response data” Does that mean it can’t find the database/incorrect path? please use contact form, so I can try to help you. This is only happening with one image. I’ve also noticed, that the images are uploaded in the uploads folder, but they are not showing up in the back end: I only get http error. please contact me using form on the page. Then we will take over on email. Below is my preview, please help! Please install “Health Check & Troubleshooting” plugin and do “Health Check”. It will show any problems with installation. Propably issue is with ‘loopback connections’. Please help me. why there is a problem in json? the image uploaded successfully. Based on what I saw this ‘error’ (which is not error) is related to ‘loopback connections’ issue. WordPress needs it to work correctly but some hosts have it disabled. I recommend installing “Health Check & Troubleshooting” plugin and do “Health Check”. It will show any problems with installation. however, I am still having the same message error which seems really strange. When I check for the uploaded file in the uploads folder, it’s there. Besides, the medias dailog isn’t showing any media, it keeps blank all the time even though there’are images in the uploads folder. I tried other various solutions, like disabling plugins, upgrading WP and changing folder permission, yet no solutions has worked for me. please help! hi, you would have to contact me using “contact me” page. Then we could proceed further. It is hard to diagnose using comments. Please I am having the same issues as well. I followed all the instructions above; there’s no issue with the upload because the file is successfuly uploaded; however, I am still having the same message error which seems really strange. When I check for the uploaded file in the uploads folder, it’s there. Besides, the medias dailog isn’t showing any media, it keeps blank all the time even though there’are images in the uploads folder. I tried other various solutions, like disabling plugins, upgrading WP and changing folder permission, yet no solutions has worked for me. Mate, I need your help. What exact error message you get? “An error occurred in the upload. Please try again later”? It is returned after upload in response with error code, do you see it? You would have to send me the screenshot with the http response or create limited user so I could try uploading myself. You can contact me using “contact” page. Hi Sebastian. Could you please tell me what’s wrong with my upload. I cannot upload an image via the media button due to this error” sorry, you are not allowed to attach files to this post.” I’ve tried many ways, deactivating plugins and switching to a default theme. The result is same. So this is not related to plugins or theme conflicts for sure. I use this plugin “Sabai Discuss” when I upload the file . This plugin use WordPress Editor. You can download a file to test in your side here https://www.dropbox.com/s/6f29xzz2y6mfleh/sabaidiscuss-1.3.47.zip?dl=0. Even more, I’ve tested the plugin locally with fresh database and wordpress files, only this plugin installed. Still I get the same error. I get this error in my live host,too. There’s nothing wrong with the file permission in the server configuration. hi, since you did all those steps (fresh install, removed other plugins) and problem still persists, it means that the Sabai Discuss does some roles check using its mechanism (ignoring WordPress permission mechanism) and does not allow you to upload file. It might be that it allows only admins to attach file (not contributor). To resolve this you will have to contact the plugins author. Good article – thanks for posting. I followed your instructions and I get a different sort of error though – I get a “WordPress database error:” with a bunch of SQL error code after that. Any ideas? those SQL errors are important. You would have to paste them here. Also, ensure that the database user has correct privileges in DB. It is strange because based on what I know those two are system fields. Have you done any operations on DB? If you have a backup I would suggest restoring it. For backup, I recommend UpdraftPlus Backup/Restore plugin. As you can see, it was succesful. In fact, the file is uplodaded. any ideas? the owner of the file is www-data but i dont think that it is the problem. Forgot to mention that all plugins are disabled but defaults. I had similar problem. File was uploaded successfully but it did not show in posts. I had to edit it, rotate, rotate back and save. Then it showed up. To fix this I gave full permissions to _parent_ whole folder where WP installation is. Then I went down with permission until I got it right. I’ll try to find out what the hell is going on. that means that the error happens after the file is uploaded from your computer. 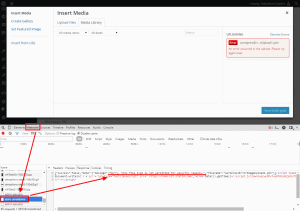 What I find helpful is this: https://codex.wordpress.org/Debugging_in_WordPress It shows how to enable logging for wordpress. Maybe this will show more information. I have try a lot of tries.. but all without success! Can you henp me please?? hi, what response do you get from WordPress? Is anyone still monitoring this thread? I’m getting the ‘file was only partially uploaded’ error… I’ve tried all the solutions I’ve found and nothing works for me! It only happens with larger files for me (images about 3000 pixels wide, so about 3-5mb). This is a brand new development. All my php settings are fine… high upload limits, and the timeout times are well in excess of when the error pops up. I’ve also tried altering the file.php with the connection: close method… nothing! this article is to show how you can find what the problem is, not how to resolve all of them as there can be a lot of issues with WordPress. – the upload folder permission was set at 777, tried a 744 and now is at 755, none worked! Please help, i´m about to pull my hair off! try disabling all plugins. First try smush plugin. It reduces media files size. Hi, very useful post. My problem is a custom login plugin. If I login via wp-login.php, there’s no any error. It works fine. However, when I login via that custom login page, I get this error. What should I do about this? Hope you’re well and thank you for putting the above together. I’ve recently moved my wordpress site from a personal hosting package to a business package due to lots of 404 errors (some issue with memory apparently). I’ve moved everything across but now images will not upload and I get the “An error occurred in the upload. Please try again later.” Error. The image looks successful in there even though it doesn’t upload. Also I’m not sure why there is a 404 still there. Sorry for the delay. First to do is to disable all the plugins and try again. 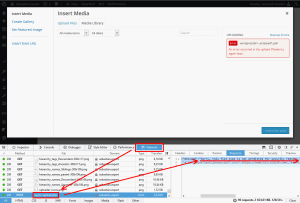 You wrote that you moved wordpress, maybe there is a plugin which operates on images (like compressing) after upload which still has old configuration? If you have just moved your site to a different folder, then you need to change your folder structure in your settings under general. Save and then try again. when following the steps in article – what error do you see? can you contact me using the ‘Contact’ form? I would need to see the screenshot of the Developers Tools with the response from your wordpress. We’re updating the table_prefix of the site and updating the database accordingly. However, we could not upload any files to the Media library anymore. We’ve tried several solutions listed above and also from different blogs, however, none of them are working. Is there any other points we’ve missed? what error message do you find using browsers development toolbar? i get this error a LOT. As in every three days or so. My solution is to reboot my computer. It might work to restart the whole browser, but I haven’t tried that. Rebooting the computer works every time. Then I can upload images until the error rears its head again. What should be the solution to this problem? I get the error message that the image cannot be uploaded when an author tries to upload an image of 512px X 512px or smaller and under 10 kb. The file folder is 755. Is there a setting in the PhpMyAdmin that needs to be set? It was working before then all of a sudden it stopped. The error only happens when uploading on the front end of the Blog but not on the Question and Answers portion of my website. hi, try to give the upload folder the 777 permissions (full) to test if upload works then. If so the permissions are the issue, if now we can move forward. hi, just e-mailed you to send me some screenshots. I have the same issue as Joe, i get no response in the Network tab after an attempted upload. hi, you would have to contact me using https://sebastian.expert/contact/ so we can try to figure out why you get no response. If there is no response you could try fiddler, but I think it will show you the same result. In case of any WordPress problem – disabling all plugins and setting temporally default template is a first step to diagnose a problem. i am trying but not fix my problem. please use contact form. Maybe we can figure something out. I have spent a lot of time to fix this. Tried everything as mentioned/suggested in many blogs like activating/deactivating plugins, changing of themes, upgrading / downgrading wordpress versions – but nothing works. Later i solved this issue. Set debug = true in wp-config. In my case i have found DB error in Post table – ID PK – AI was not set. I think it had occurred while migrating DB from one server to another – may be due to MySQL version mismatch. Just alter this table set ID as PK and AI is ON. It will work. thank you for the information. I will update the article and include your comment. I did what you suggested for the first problem (unable to upload). I am trying to upload an imahge frm my pc to my LOCAL database (using xampp and wordpress), The resulting error message is not clear at all, and is reported here. note: news_maxx_lite is the WP theme downloaded from wp site. The image I am trying to upload is only 120kB in size, so the size cannot be the issue. Can you help me? The JSON message states that the upload to WordPress was successful. What failed is a call that uses ‘news_maxx_lite_image_size_names_choose’ which was not found. You should contact theme developer and provide him with that logs. What you could do now is try to change theme to WordPress default and then back to news maxx lite. Disable all plugins and see if you get this error. If it does work then enable each plugin along with test if image can be uploaded. I am using wordpress 4.2.5 and when I upload image and check the async-upload.php ajax call, the response returned from the server contains the links to uploaded image and all relevant details. However, it also contains the red error message as shown in your post. I believe no errors occur as file can be found on website as attachment and through direct link. Can you please suggest what the cause could be? image can be accessible after upload but if you get error message during upload some properties might not be set correctly. I will email you on the provided email address for further conversation. Hi, sorry for late reply; was busy in the project. I have found the issue.The post I was editing was locked for edit by another user. So, while the image was successfully being uploaded, wordpress was unable to assign it to that particular post. After unlocking the post, everything worked fine. Thanks for your help and the above article was really helpful. I am having the same error i am too much stressed due to this error. Please tell me sollution of this problem. have you tried the steps from the post? What is the error you get in Network tab? Could you send me a screenshot of the response (or lack of it)? Also can you send me a screenshot of “headers” tab? Hi, trying this but it’s not displaying any responses.